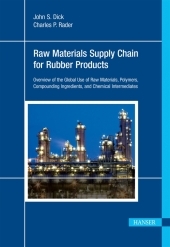 This book provides a current overview of the chemical supply chain for the global rubber industry. It also reviews the present and future international changes and their effects on this chemical supply chain for rubber producers, compounding ingredient manufacturers, custom mixers, rubber fabricators, molders, extruders and others. The reader will be enabled to understand the chemical connectivity of rubber compounding materials to their chemical feedstocks. The reader should also be able to directly link new commercial changes in 175 commonly used chemical feedstocks to hundreds of different rubber compounding ingredients and polymers. 12. Intermediate Feedstocks (which includes the 30 vital intermediates, as well as 135 other critical chemical intermediates with detailed information regarding availability disruptions that occur when they are in short supply).